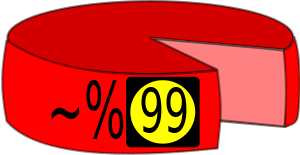 “We are the 99 percent” is a false frame for several reasons, including that there is nothing inherently wrong with being in the top one percent of wealth holders. This becomes obvious with the simple example of 100 individuals, ranging in assets from $1 to $100 each, incrementing by one dollar in each case, from person 1 to person 100. It is also a false frame because there is no distinction between those in the top one percent who acquired their wealth legally and without special government privileges, and those who didn’t. It also doesn’t distinguish between those in the 99 percent who acquired their wealth legally and without special government privileges, and those who didn’t. There is no consideration given to those in the one percent who give much in charity, whether publicly or privately, than those who give hardly any, or just enough to meet their social expectations. However, you won’t be hearing that frame anytime soon, and not because it’s not as catchy as the “we are the 99 percent,” but because it doesn’t serve the agenda of those who seek to divide us in order to conquer us.